Located in the Gold Coast at the corner of Delaware and State Street, Ten East Delaware is a luxury boutique building designed by world famous architect, Lucien Lagrange. 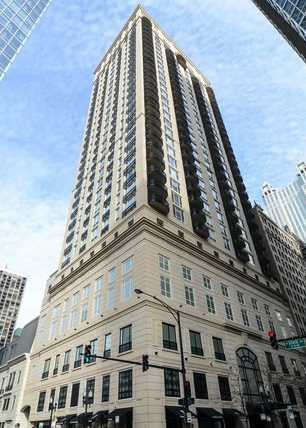 This newly constructed building is home to 121 new luxury condominiums that are sure to "wow" luxury home buyers in Chicago, especially once you learn more about the building below. In addition, the location of the condos at Ten East Delaware puts residents right in the heart of Streeterville, River North, and the Gold Coast combined! Fabulous dining, world-class shopping, and a full compliment of big city amenities surround the building at 10 W. Delaware, so when looking for the right luxury condo here in downtown Chicago, start your search right here in this exclusive Windy City high-rise! Condos for sale at Ten East Delaware in Chicago are listed below, and for more information or to schedule a private showing, contact Helaine Cohen today at (312) 953-0961. Exclusive amenities and services at Ten East Delaware include the private Ten Club, a resident-only facility featuring a rooftop pool, a sundeck and landscaped gardens, and a state-of-the art fitness center and a club room. The building offers a la carte hotel and restaurant services upon request. Ten East Delaware's standard features include Poggenpohl cabinetry, granite custom countertops, Wolf cook tops and ovens, and Sub-Zero brand refrigerators. Master bedrooms feature generous walk-in closets, en suite marble baths with extra-deep Kohler soaker tubs, imported ceramics and superb fixtures — all of which combine to create a spa-like experience. Ten East Delaware condos also feature large private balconies with custom designed wrought-iron detailing. Contact Helaine Cohen and her team of condos specialists today to arrange a tour of Ten East Delaware condominiums that are currently available. Listing information last updated on April 25th, 2019 at 3:38pm CDT.